FoodSPAM: the Kind You Eat. The Kind I Eat, Anyway. SPAM: the Kind You Eat. The Kind I Eat, Anyway. I haven’t had SPAM in decades, but I used to eat it a lot. I bought a can last month, and finally opened it. I remember the block of meat glopping out, coated with translucent glop like the juice that congeals when you put your baked ham in the refrigerator. No glop, now. I miss the glop. Probably because the glop is missing, possibly because there seems to be less fat in the product, it doesn’t brown and crisp the way I remember. I still like it. It tastes kind of hammy and kind of pork-roast-y. Too salty, but they have a low-sodium version I might try the next time I buy a can, forty-odd years from now. 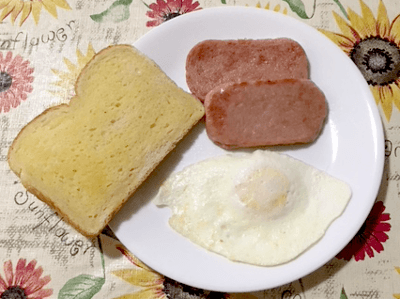 Spam and eggs, o’ course. Classic. I’m posting today at Fatal Foodies about a food even less appetizing than this. A WRITING PROMPT FROM ME TO YOU: Your character eats an “unappetizing” food and loves it. This entry was posted in Food. Tagged memories. I do like Spam (with eggs of course) but I haven’t had it in years. I was surprised to see that they have a bunch of varieties. I was, too. We only have a couple around here, but maybe there’ll be more around the holidays…? No glop??!! I cannot even imagine. My mom used to fry it for my dad super thin…I did not care for it. Later (I don’t remember now where…) I had it sliced thicker and liked it much better! 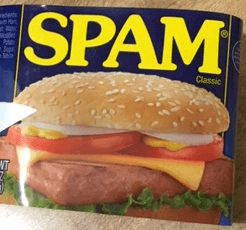 I haven’t thought about SPAM in years! Gee, even canned hams (particularly the Polish ones) are still wrapped in gelatin (i.e. glop) to keep them from moving around. I know! So sad! On the other hand, this SPAM couldn’t move around because it was fully packed, so: more SPAM per can. Do you fry it in butter? You might try that, if you don’t already. That sounds like a plan! Thankee! My dear friend, now I know why you are weird – you actually like and eat SPAM. I literally HATE SPAM. Thank you. I will take you up on the Benedictine, though. LOVE it. In honour of this post. I shall have Holiday Brand. Spam is horribly expensive over here. And I have no Klick, or Kam. So Holiday, eggs, toast and beans. Or corn, not sure what. But, I, of course, cannot confirm that I am not a spammer! After all, what do you call someone who eats Spam? “Holiday, eggs, toast and beans.” Sounds like a feast to me! And do you butter the toast and put the beans over it? That’s my groove. The eggs fried or scrambled, and the Holiday meat fried. The beans heated in the fry pan. But my dinner guest wanted mini pizzas instead. Maybe tonight! But would you put the beans ON the buttered toast? That’s the question being put to you, Mr. Laberge! Me, I put the hot beans ON the buttered toast–Mmmm, so good! Sometimes I layer EBBYFING onto the buttered toast! This, from a child who never wanted her foods to touch. ON THE TOAST! How else? Beans have a purpose. But you can also take a spoonfull, and a bite of toast. Either way, they taste good. I still have never tried Spam. If I come to visit, will you cook me Spam AND RICE PUDDIN? Absolutely! And I’ll make Benedictine!